I am mounting a Samsung TV to the wall. I purchased the best selling TV wall mount kit. I have everything setup to mount the TV. I have the tools and all the hardware needed. The problem I am having is the screws that came with the TV mounting kit do not seem to fit into the back of the TV. The screws that came with the TV mount kit are too wide. I am not able to secure the TV to the mounting bracket. Am I missing something? How can I find out which type of screws fit into my TV to hold the bracket? What SIZE Screws Do I Need From Wall Bracket To TV? The most common screw for securing the TV to the wall bracket is an M8 screw. 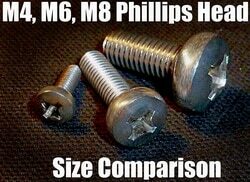 The other screw sizes for some TVs are M4, M5, and M6. The length will be determined by the type of TV you have. The length of the screws will be in conjunction with the depth of your specific TV. 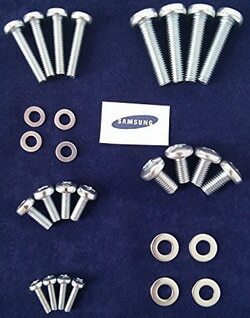 The most common M8 screw lengths for TVs is 10mm, 12mm, 20mm, 25mm, 30mm, 40mm, 50mm, and 60mm. There are some TVs that require a longer millimeter screw. Most screws will need to have a spacer on it to allow airflow behind TV, etc. Put a pencil or toothpick down into the screw hole to find a rough estimate of the depth or length of screw needed. 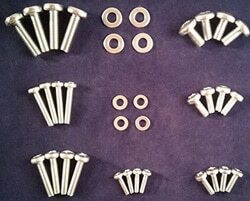 You can also purchase a Universal TV to Wall Bracket Screw Kit and have all the screws needed including spacers and washers. 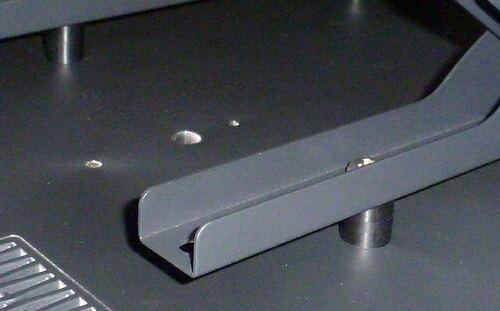 The screw that holds the mounting bracket to the TV should have at least 5mm of threads into the TV to hold it secure. 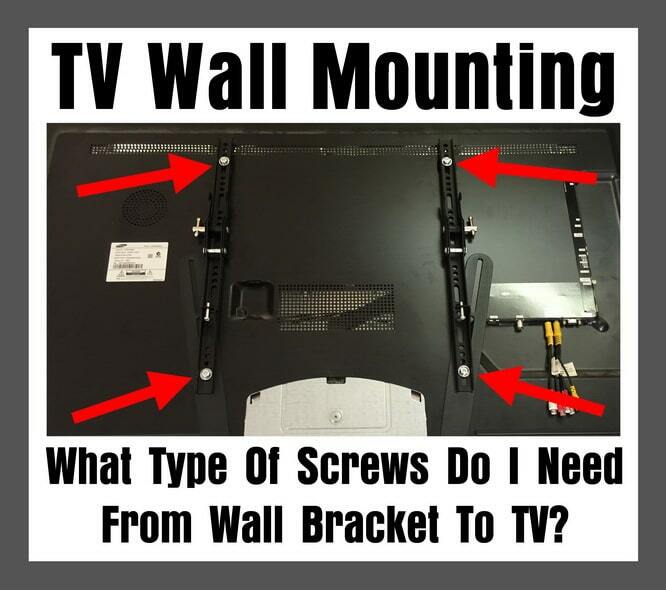 Be sure you add the depth or thickness of the TV mounting bracket when finding the correct screw length. 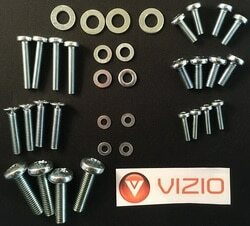 Here are TV to Wall Bracket Screw Kits for Samsung TVs, LG TVs, Vizio TVs, and Universal TV Mounting Screws and Washer Kits. Have a professional do it for you for around $75 dollars. Amazon now offers Amazon Home Services and part of this service offers Professional TV Wall Mounting. Need Someone To Mount Your TV To The Wall For You? 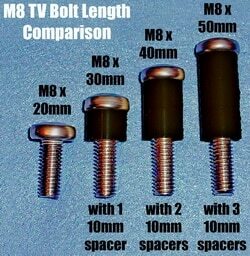 Need help finding the correct length and diameter screws for your TV mount? Please leave your question below and we will be happy to assist! Looking for the screw length of an M6 screw for the mounting screw to the back of a Sharp Roku 55inch uhd tv. I have a philips 2006 plasma t.v. model 42pf7321d/37 with a vesa of 800×400. I bought a universal t.v. base stand and I need to know what screw size I mount it with! Its a base stand with the 2 separate legs not the square one that’s attached together! HELP! 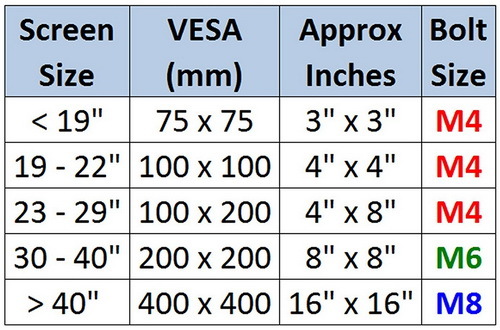 What size screw will I need to mount a JVC 65″ tv? 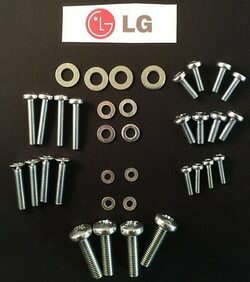 What size screw do I need to fitr the back of my Samsung TV Model # UN32J4000AFXZA Version#LF05? What size screw would I need for a 55 inch Westinghouse TV to install the stand? In the manual it says B-MAX 14, I called the company and they said it would be st 4×12 but i am not sure of it. Are you removing the TV from the wall and just wanting to put it back on the stand and you lost the screws that hold the TV to the stand? Previous post: Is Blue Always Cold And Red Always Hot On A Water Faucet?